I feel like panna cotta was one of those 'fancy' desserts our parents enjoyed in the early nineties so they will probably roll their eyes when they read how excited I am about this not so revolutionary dessert. Recently I've been seeing it crop up on menus around the place and flip it is delicious. Unlike most trends from the nineties (read: slip dresses, faux tattoo chokers, velvet) this is one that I am thrilled has made a comeback. A few months ago in Wellington we went to this wee Italian place with our friends and for dessert they served up panna cotta in a slab form rather than an individual mold. I love how something typically dainty and individually served was reduced to the status of say an apple crumble and designed to efficiently feed the hungry masses at the table. Sure it wasn't the prettiest but I really liked the sense of family it gave. We threw an Italian inspired Supper Club two weekends ago; a theme centred solely around the fact that I wanted to make a slab of panna cotta for dessert. Of course messy slabs of panna cotta photographed in dim artificial light wouldn't make for a pretty blog post so I made a few individual ones in my Nana's tea cups to pop up on here. Panna cotta is so easy to make. It pretty much consists of cream, sugar and gelatine. I didn't faff around with leaves of gelatine, instead the boxed crystals from the regular old super market did the trick. I drew inspiration from the blog Apt. 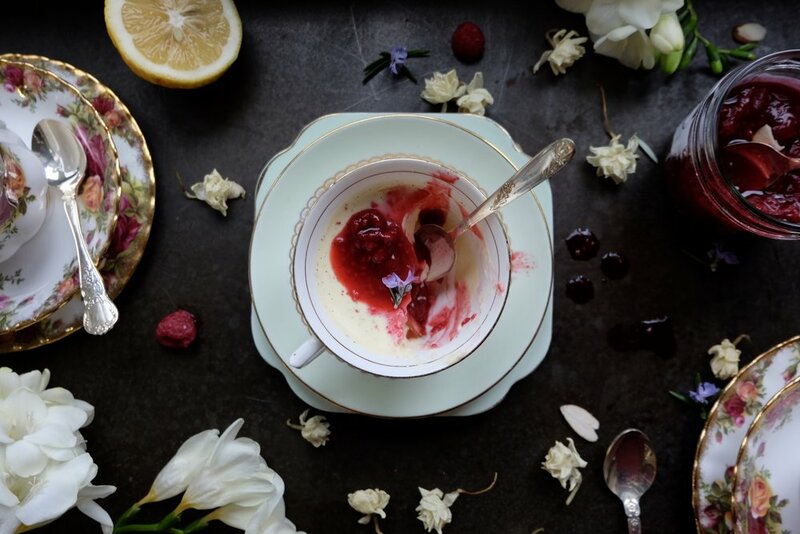 2B Baking Co. and their recipe for rhubarb and honey panna cotta. They recommended using kefir instead of milk to lend a slightly sharper taste to the cream as well as honey instead of regular sugar to sweeten. I wanted to do rhubarb too but after searching Christchurch high and low for rhubarb I couldn't find a single stalk. Last minute we changed the topping to a raspberry compote instead. This recipe below will make six wee pots worth of panna cotta. To make a slab double the recipe and then place it in a non-stick baking tin 25 x 15cm in size (I got mine for a song from Kmart). Inspired by the Apt. 2B Baking Co.
Place your yoghurt in a bowl, if it is quite thick use just less than a cup and top the rest up with milk and whisk together. Sprinkle over the gelatine crystals and leave for around ten minutes for them to hydrate. In the meantime place the cream, honey, vanilla and salt in a saucepan and heat until warm stirring to dissolve the honey. Add the yoghurt and gelatine to the warm cream and continue to whisk and heat until all the gelatine crystals have dissolved. Remove from the heat and leave to one side to cool. Once room temperature take six ramekins or small cups and divide the panna cotta between them evenly (around 125ml or half a cup each). Cover each cup in cling film and leave in the fridge for eight hours or overnight. To make the raspberry compote, place the raspberries, sugar and lemon zest and juice in a sauce pan and bring to a simmer. Once the raspberries have defrosted and have only just started breaking down in structure remove them from the heat. Leave to cool to either room temperature or leave to cool in the fridge until ready to serve. 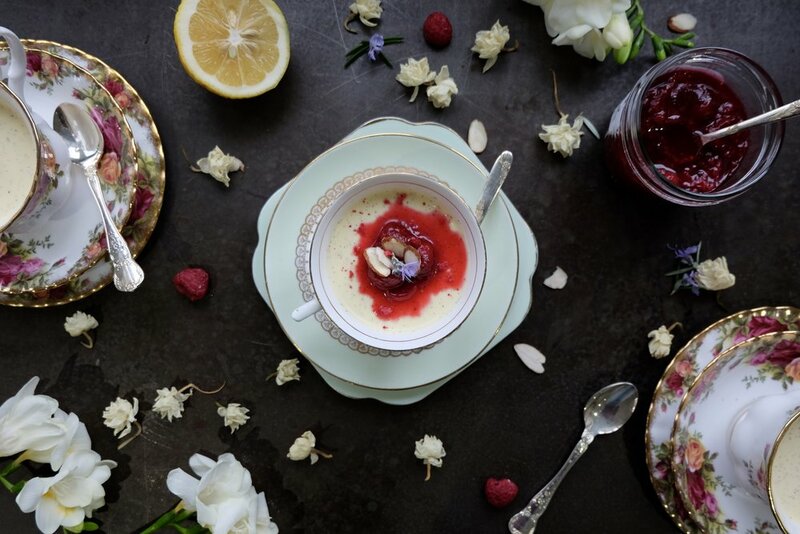 To serve just dollop on a spoonful of raspberry along with some flaked almonds, freeze-dried raspberry pieces and a flower if you fancy. These will keep in the fridge for a few days. To serve a slab of panna cotta, very briefly dip the baking tray in a larger tray of hot water (emphasis on briefly). Place a clean board over the top and then flip over. Slice into pieces with a sharp knife and use a spatula to wiggle the pieces onto individual plates. Serve as above with the raspberry.